During these tough times of spiraling cost and stagnant wages, everyone is trying to cut down on cost and they no longer want to spend their hard earned money on payment for a car. You, too, must be falling in the same line and like everyone else, must be contemplating to buy a used car. Let me tell you, this is the “in” thing and the easiest and cheapest way to go about it is, online car sites and from a private individual. Get into the internet; browse through hundreds of listings from the comfort of your home; make a comparative analysis of the prices and email or call the seller to negotiate a deal. Since this process is very convenient and you can actually strike a deal even before seeing the vehicle in person; however, do not overlook the dangers associated with this and try to follow the below 5 tips before taking a decision. 1) Be inquisitive and ask questions as to why he wants to sell off his vehicle. Listen to him carefully and gather full facts about the vehicle so that you do not have to repent at a later date. 2) Ask the seller about all the relevant details about his vehicle before you actually visit in person. It is understandable that he might forget some points to mention, but it is okay; at least you will have a fair idea about what you are dealing with. 3) A seller cannot be rigid on the price and before going make sure that he is open to negotiation. After all, this is not the only one available and only give in, if you feel that the car is exceptionally good. 4) Save your gasoline expenditure, since you need not travel miles to get your dream car. Unless the deal is unbelievably true, which in most cases are not, stick to your local market; you are bound to get a plethora of used cars to choose from. 5) Make it a point to see detailed pictures of the car that you intend to buy. Sometimes it might happen that the seller is not techno savvy and find it difficult to use a digital camera and/or upload a picture on the website, but in most cases it had been seen that sellers who are reluctant to upload a photograph of their vehicle along with the advertisement, try to suppress some facts. If you are really interested in an offer but do not find a picture of the vehicle; email or call the seller and ask him to send you some pictures. If he refuses or does not pay heed to your request, move on to the next seller. 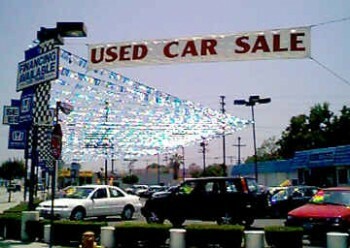 It is always a gamble to buy a used car. Get the VIN number of the car that you are interested in and run a Carfax report to know about the vehicles history as well as the manner in which it had been taken care of; this way, you can increase your probability of securing a good deal. Take a car mechanic along with you and get the car checked thoroughly before you decide to buy it. Once you buy it, the seller is not going to take it back; hence, protect yourself against any untoward incident. There are other things too, that you should keep in mind. Make sure the title is under the seller’s name, which you can confirm from his ID and is filled out properly to avoid being hassled by DMV. If the car is being sold by his family member or friend, verify their identification. Also have the sale agreement documented on paper and have a Bill of Sale signed. Negotiate reasonably and get the best deal for you. Follow these steps and make the process of buying a used car online, smooth and effective.